When alt.D1 was tiny, she cried a lot. She cried in the day time and the night time. She cried when she wasn’t being fed, she cried if she was left alone for a second. She cried if you tried to sit down when you were holding her. We put her in the pram and we went for walks, mostly she cried, sometimes she fell asleep. We paced the floor with her chewing on one of our fingers, we bounced, we rocked… you get the idea. She was LOUD and SAD. I would push the pram down the hill to baby groups, and they would hear us coming. “Oh we heard alt.D1, she’s git such a sweet cry!” I would grit my teeth – it wasn’t so sweet at 2.30am,or 2.50, or 3.20… People arriving after us would say “We knew you were here already, we could hear alt.D1, she’s got such a sweet cry…” Sigh. There were nights spent watching reruns on TV through cordless headphones while we wore tracks into the carpet trying to get her back to sleep. There were days when nothing was achieved, having been spent trudging round town with the pram in an attempt to get her to sleep, and when that was achieved, I daren’t go home because the eyes, those big brown saucer eyes, would pop open as soon as we crossed the threshold. Then, when she was about four months old, we had a revelation. We bought a sling and it changed our lives. I am never more evangelical than when I am talking about my sling! Seriously: Our. Lives. Changed. Suddenly, we could wrap up the baby, and within five minutes she would be asleep. We could do the pacing around bit, or we could mow the lawn instead, baby in tow! Dinner could be prepared; better yet, actually eaten whilst it was hot! Wow – who ever would have thought! I ordered the sling online, having tried putting Alt.D1 into a borrowed one at someone else’s house. We’d been given a baby carrier with webbing, buckles and straps, and although it was complicated to put on the wearer, Alt.D1 had liked it and seemed more settled. She had fought it (loudly!) when turned in towards my chest, but on turning to the outside world, she had been absorbed and fascinated, and, it seems, sometimes bored to sleep! I had read on the internet about the risks of hip dysplasia in such kinds of carriers, and realised it wasn’t putting her in the most comfortable position. A different kind of sling, a long stretchy wrap which is tied to the adult, not involving buckles or straps was the answer. And we all loved it. She would sleep in the sling where you would never have thought it possible. Suddenly our lives had changed for the better. We had a portable child, and more to the point, a settled child. Jean Liedloff recognised a huge impact on children’s development when they are carried. She calls it “the in arms experience” in her book The Continuum Concept. Liedloff noticed that the babies of the Venezuelan people that she studied were carried by their parents all the time. They were, as a result, easier to hold, because they were used to it. They didn’t fuss and stretch and go stiff as a board like Alt.D1 when I tried to put her in the car seat. They didn’t bend backwards in the middle, striking out towards the floor. We noticed a change in Alt.D1 immediately we started to use the sling. So, when Alt.D2 was born, we didn’t need to think about it. She went in the sling straight away. I can’t imagine how I would have managed with two small children without it, to be honest. The baby would sleep, cosied up on my chest, and I could play with the big one. I could prepare food, walk to town, play dragons and princesses, or hide and seek, while my baby was contented and snoozing. Alt.Father is pleased to wear the sling, too. I deliberately chose a plain navy colour, which just happens to match his favourite jumper. In town one day, two teenage girls did a double take in the market while he was out shopping with Alt.D1. “Oooh, I thought that man had two heads!” one said to the other. Alt.D1 was peeping out of the sling, apparently suspended from her dad’s top! He’s even had one on the front and one on the back on more than one occasion! There are more benefits than just the practical. In the early days with Alt.D2 I was finding it hard to really appreciate her. I was bonding more slowly than I had with Alt.D1. But by wearing her on my body for long stretches of time, hours while she would sleep, wake, feed and sleep again, all without being parted from me, our bond strengthened immeasurably. She was always within kissing distance, our hearts close together. She was comforted by the sounds she had heard within the womb; my muffled voice and my heartbeat. I got to learn her ways, the rhythms by which she lived, and her cues for hunger, tiredness, and so on. We enjoyed what has been termed “the fourth trimester”. I now have a happy, confident almost-eight month old, and she and I are as in love with each other as we could possibly be. So as I said earlier, I am positively evangelical about babywearing. 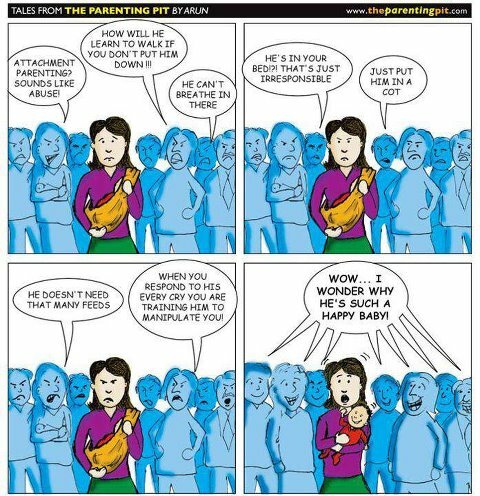 I will enthuse to any new parents, or parents-to-be about how a sling changed our lives and saved our sanity. You can borrow slings from local “sling libraries” before you invest, and there is a host of different designs, patterns and colours to choose from. Among some friends of mine, slings are talked about in the same way and with the same enthisiasm as the latest designer clothes. We are “sling geeks” if you will! Carry that baby, you won’t regret it. Happy 2013… oh wait, we’ve been here for a while!